Rep. Ron DeSantis, left, speaks after President Donald Trump formally endorsed him for the GOP nomination for Florida Governor at a July 31, 2018 rally at the Florida State Fairgrounds in Tampa. 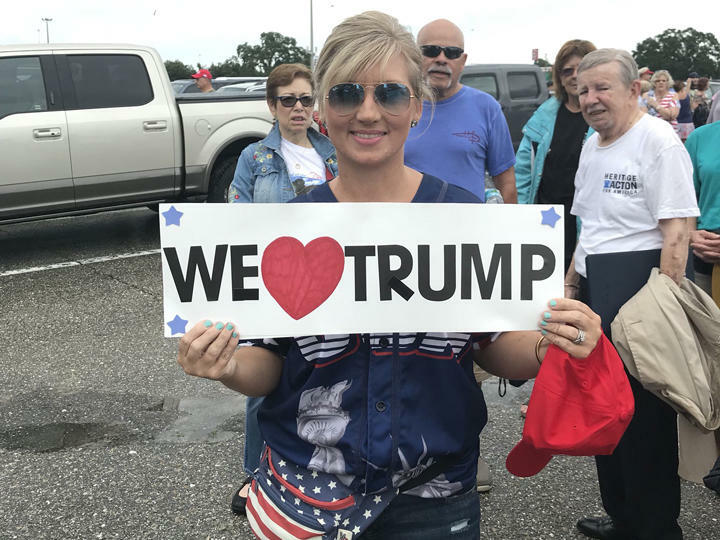 Palm Beach County resident Christy Moore said she supports President Trump because he exemplifies trust and loyalty. Crowds gathered outside the Trump rally in Tampa to protest. CLICK HERE FOR A PHOTO GALLERY FROM TRUMP'S VISIT. Trump also attacked the Democratic candidates for being lax on crime. "These are people that don't care about stopping crime, these are people who don't care about people pouring into our country," he said. 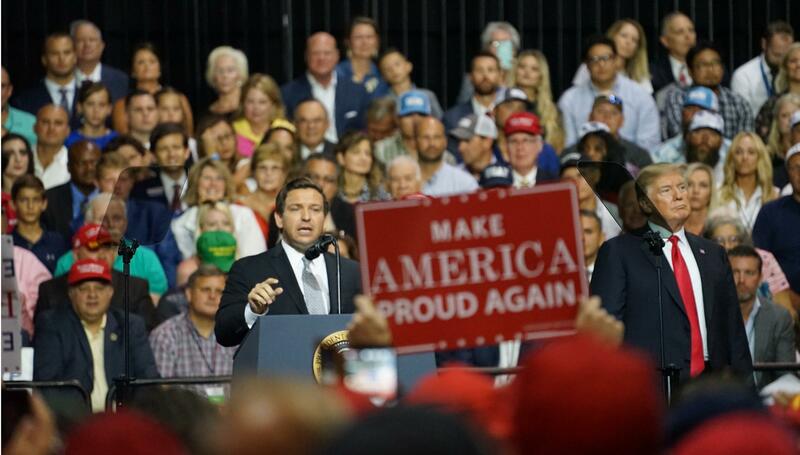 "Your future governor [Ron DeSantis] cares, and your current governor cares." Trump railed against Democratic Sen. Bill Nelson, who is being challenged by Trump ally Gov. Rick Scott in a high-profile Senate race. Scott didn't join Trump at the rally but appeared with him at an earlier roundtable event at Tampa Bay Tech. During the speech, which lasted more than an hour, Trump listed off reasons why voters should elect Republicans who would help him carry out his agenda. He pointed to the country’s economic success and low unemployment and touted the progress he’s made fulfilling a campaign promise to put America first. He also compared himself to an icon of the Republican Party, Abraham Lincoln. Trump asserted that he's the most popular person in the Republican Party. He said he can be "more presidential than any president in history," except for Lincoln, "with that big hat" and joked that "Abe Lincoln is tough." The president has claimed in recent days that he has higher poll numbers than Lincoln. But he doesn't mention that there were no scientific opinion polls in the 1860s when Lincoln was president. While advocating for voter ID requirements, Trump wrongly claimed that Americans need photo IDs to buy groceries as he railed against the idea of noncitizens voting. He said the only time people don't need ID is when they want to vote. "If you go out and you want to buy groceries, you need a picture on a card, you need ID,” Trump said. “You go out and you want to buy anything, you need ID and you need your picture." Appearing at Tampa Bay Tech, Trump praised the strength of the economy, telling students and faculty members there was never a better time to learn new skills and gain employment. He was joined by Scott, Education Secretary Betsy DeVos, daughter and adviser Ivanka Trump and several members of Congress from Florida. Trump also held a signing ceremony for a technical education law he signed earlier in the day at the White House. He's presenting a copy of the law to the school. 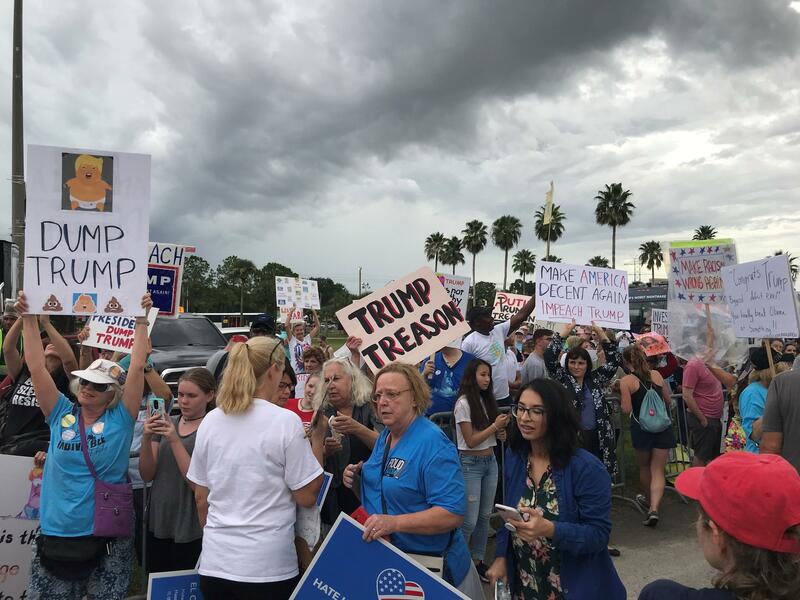 Protesters gathered outside the fairgrounds expo hall to protest President Donald Trump's visit hours before his scheduled arrival. One of the early protesters was Democratic gubernatorial candidate and Florida billionaire Jeff Greene. He parked a bus with the words "Trump's worst nightmare" outside the venue Tuesday, drawing more than a few heckles and taunts. He says he wants Trump "to see that not everyone believes in what he does here in Florida." The protests eventually grew big enough that police had to separate protestors from Trump supporters filing into the campaign rally. Just before the rally officially started, opposing chants erupted -- both for and against Trump's proposed wall at the Mexico border. Laura Manson traveled from Lakeland and said she thinks Donald Trump is too divisive. "The end result of that is not going to be good for my country,” Manson said. “And I have relatives that fought in the American Revolution, the Civil War, World War I and World War II, so that's why I'm here today. They fought, and I am fighting." At one point when one supporter got a bit too close to protestors outside the hall, a police officer on horseback had to break up an escalating argument. Glen Eich from Tampa brought several protest signs and said he came to demonstrate against Trump’s immigration policy. Cruz said he came to the rally to represent Black Lives Matter-Tampa. He said, in many ways he and his friends are still in shock that Donald Trump was elected.